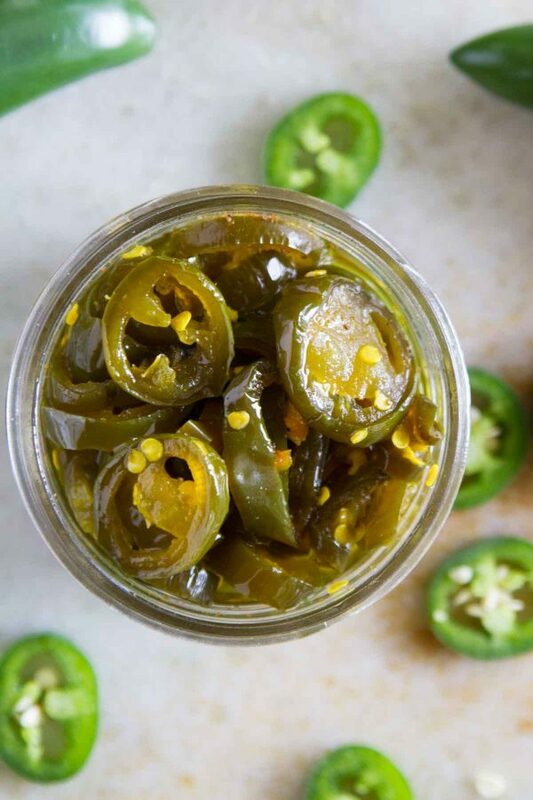 Sweet and spicy and incredibly addictive – you’ll never want to go back to a normal pickled jalapeño after trying these Candied Jalapeños. When my husband and I bought our first house after we got married, we both had this dream of a large garden and lots of produce. We had a decent sized area in the backyard, so that’s what we did. We planted. There were only the two of us at the time, but that garden could have easily fed 5 times that many people. Yes, we were a little overly ambitious. So I thought I’d get into canning as a way to address the extra produce. My mom did it when I was a kid, my husband’s parents are avid canners – surely I could do it too, right? So I started canning. But then I quickly realized that once I had those canned goods, they just sat in the pantry because I had no idea what to actually do with them after they were canned. So after that first year, I kind of gave up on canning. 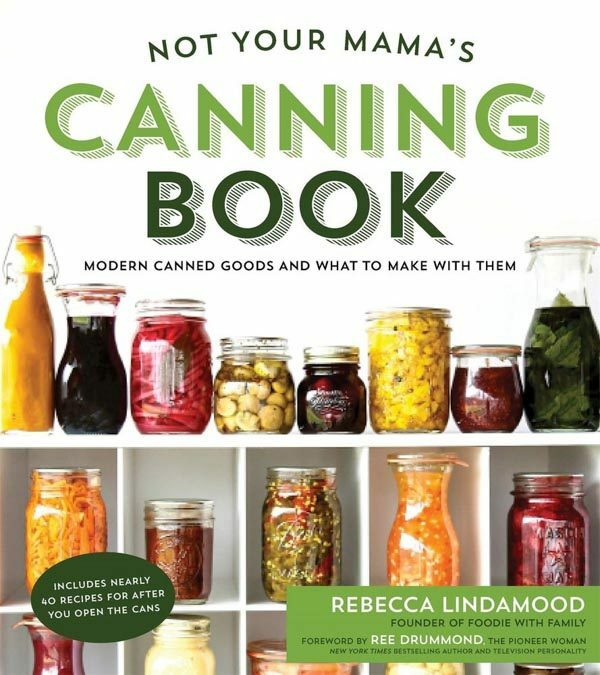 So when I first heard about Rebecca Lindamood’s cookbook – Not Your Mama’s Canning Book – I was very excited, because it is definitely different than the other canning books out there. 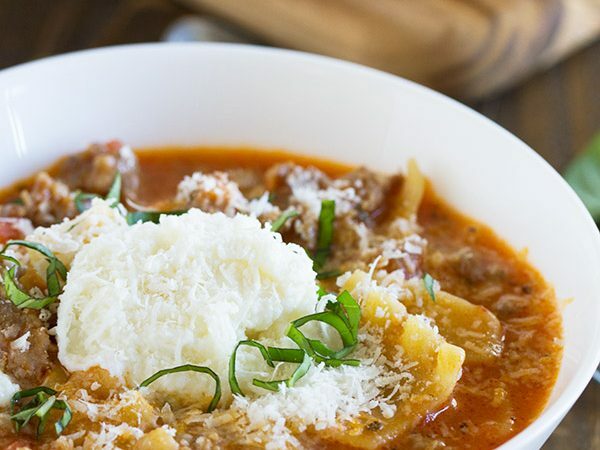 In the book, Rebecca (from the blog Foodie with Family) shares modern canning recipes PLUS recipes to actually use those canned goods. It is simply a brilliant idea. All of a sudden, my excuse for not wanting to can anymore is solved with this one book. Number of Photos: lots. It looks like there is a photo for each recipe. Difficultly Level of Recipes: Easy to Medium. If you are a beginning canner, no need to be intimidated! I think the instructions are laid out clearly, so both beginners and experts will find something they love. Availability of Ingredients: Easy to Medium. I’m going to include equipment on this as well. The ingredients themselves should be fairly easy to find. But you will need canning equipment to make these recipes. 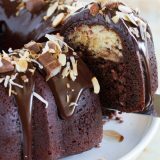 Some of the recipes call for a pressure canner, which I don’t have, so right now, I wouldn’t be able to make everything. But I do want to add a pressure canner to my kitchen now!! Buy Not Your Mama’s Canning Book on Amazon. Now, this post is actually a long time coming. I originally made these back in August. Rebecca says to let them sit for at least 2 weeks, but preferably a month. I wanted to make sure and get the full effect, so I wanted to make sure they sat for at least a month. And then the holidays came, and then moving prep started, so it has taken me way too long to share this recipe and this book with all of you. I didn’t have a lot of crazy pregnancy cravings, but when I was pregnant with my first, all I wanted were jalapenos. Not fresh jalapenos, but pickled jalapenos. I would eat them on everything. Breakfast, lunch and dinner. Now, that craving has settled down a bit, but I still always have a jar of pickled jalapenos in the fridge because I love them so much. Well, move aside, regular pickled jalapenos, because you’ve been replaced. By these Candied Jalapenos. Seriously – if you love the sweet and spicy combination, you’ll be eating these like candy. 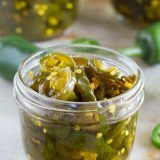 I have actually wanted to make these ever since I first saw these Candied Jalapenos on Rebecca’s blog. I was so happy to see that they were included in this cookbook, so of course it was my first recipe to try. 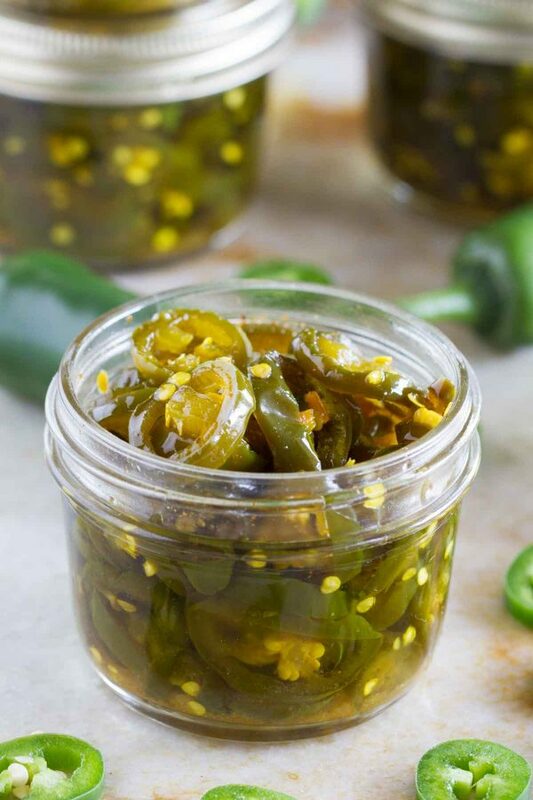 If you are new to canning, these Candied Jalapenos are a really good place to start. Because they are very easy. And inexpensive. And addictive. We’ll be able to have a garden again in our new house, and I’ve already planned on growing some jalapenos just so I can always keep these canned and on hand!! In the book, Rebecca adds these Candied Jalapenos to an antipasto plate, and then to top tortilla soup. My favorite way to enjoy them so far (besides straight out of the jar) was actually on pizza. 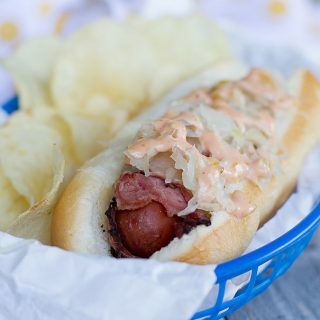 Canadian bacon, pineapple and candied jalapenos – a new favorite!! It’s time to make your canning game strong, and this book is going to turn you into a rockstar! 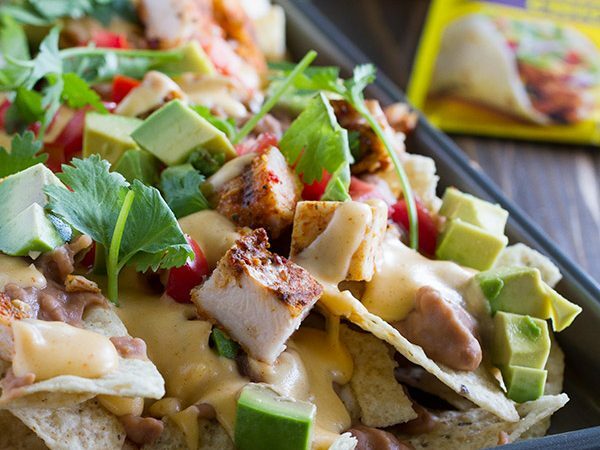 Looking for more ways to use those jalapenos? 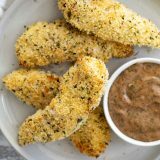 They would go great on these Smoky Tex-Mex Sloppy Joses, these Smoky Pork BBQ Sandwiches or these Bold Ranch Spicy Chicken Tacos. 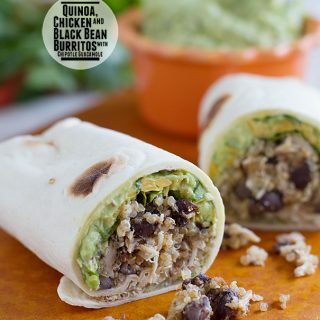 Or how about these recipes from other blogs: Slow Cooker Cuban Tortas, Filthy Burgers, or Poblano Braised Beef Tacos. Remove the stems from all of the jalapeños. (You’ll want to use disposable rubber or latex gloves to avoid burning your hands.) Dispose of the stems and slice the peppers into uniform 1/8 – to 1/4-inch rounds. Set aside. 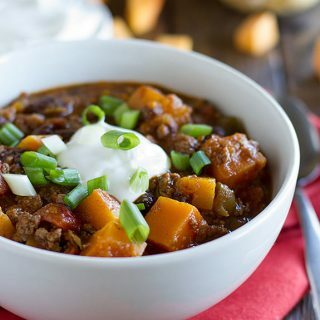 Combine the cider vinegar, sugar, granulated garlic, cayenne pepper, turmeric and celery seed in a large pot and bring to a boil. Reduce the heat and simmer for 5 minutes. 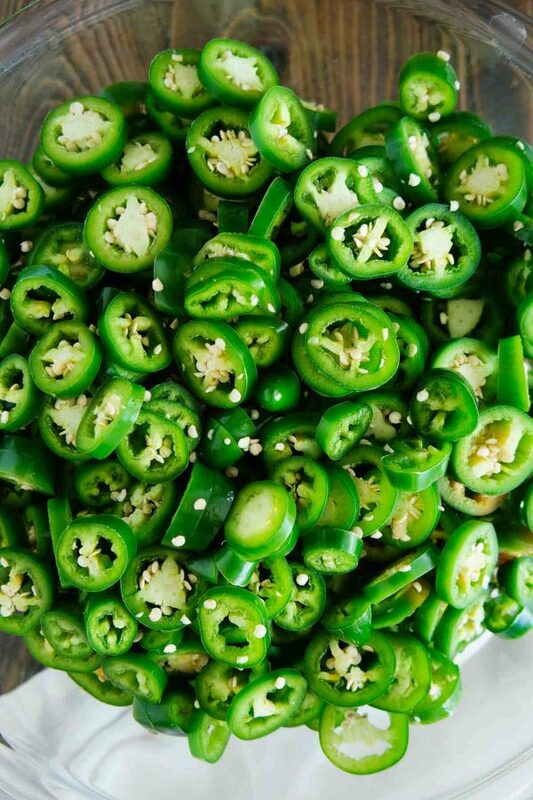 Add the jalapeño slices, bring back to a boil, and boil for exactly 4 minutes. Use a slotted spoon to transfer the peppers into clean, sterile canning jars to within 1/4-inch of the upper rim. Turn the heat up on the syrup and bring to a rolling boil. Boil hard for 6 minutes. 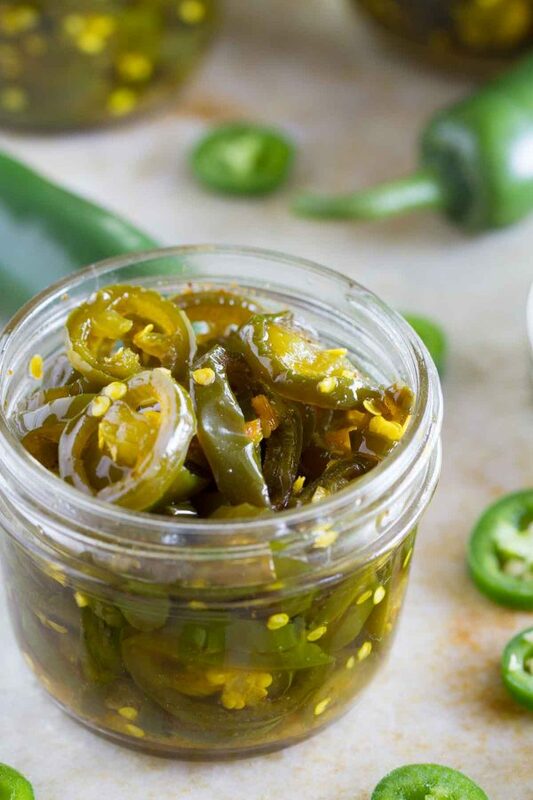 Use a ladle to pour the boiling syrup into the jars with the jalapenos. Insert a cooking chopstick to the bottom of each jar a few times to release any air pockets. Add more syrup if necessary. Wipe the rims of the jars clean with a damp paper towel and place lids on the jars. Fasten appropriately. Place the jars in a canner and cover with water by 2 inches. Bring the water to a full rolling boil. When the water comes to a boil, set a timer for 10 minutes for half-pint jars or 15 minutes for pints. Use canning tongs to transfer the jars to a cooling rack. Leave them to cool, undisturbed, for 24 hours. When cool, wipe the jars clean with a damp washcloth and label. Allow the peppers to mellow for at least 2 weeks, but preferably 1 month before eating. Total time doesn’t include time for the jalapenos to sit. Okay. You seriously rocked me with this review! Thank you so much, Deborah!! And I fully get the desire to plop these little things into and onto everything. My husband can go through half a pint jar in a meal. Eep. He’s tougher than I am. Thank you a million times over for this beautiful review! 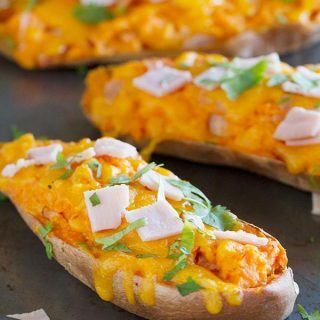 This is a great recipe, Deborah! I will definitely give it a try!